Friday, March 2nd, 11a.m. — Reading Block: I’m ecstatic to be reading my work at a conference for the first time. My reading block is with Randy D. Rubin and Scott Edelman — good stuff! It’s sure to be a wonderful and weird time. Saturday, March 3rd, noon, — Women In Horror Month Panel: I can’t wait to talk about my favorite ladies in horror and gush about their work, influence, and inspiration. This panel is with Amber Newberry, Kathleen Scheiner, Linda Addison, Meghan Acruri-Moran, and moderated by Carol Gyzander. Saturday, March 3rd, 3:00pm, — Terrifying Teaching Tactics Panel: Horror in the classroom? Oh yes. This panel is going to be a blast, and I’ll be chatting with Frazer Lee, Heather Herrman, Tom F. Monteleone, and the madness is moderated by Mike Arnzen. Saturday, March 3rd, 4:00pm, — Breaking Barriers with Horror Poetry Panel: Poetry is one of my favorite things to write, talk about, and study, so I’m thrilled to be on this panel with John Edward Lawson, Marge Simon, Randy D. Rubin, and Stephanie Wytovich, moderated by the brilliant Linda Addison. In between all of this, I can’t wait to attend workshops, classes, a pitch session, see old friends, and fangirl over some of the writers who will be attending this year. See you all at the Biltmore! 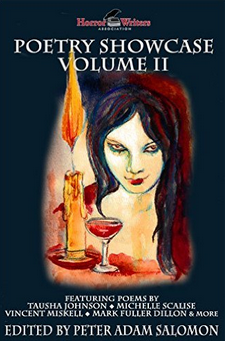 My poem “Rot Inside You” is in Volume II of the HWA Poetry Showcase. I’ve been reading through the other selected pieces and trust me, you’ll want a copy of this!